ROYAL EDGE Products | Roofing Products International, Inc.
RPI Royal Edge Non-Reinforced EPDM is a black single-ply low slope fire rated EPDM membrane without a reinforcing scrim, used in Fully Adhered, Mechanically Attached, and Ballasted roofing systems. RPI Royal Edge Reinforced EPDM is a cured EPDM single-ply roofing membrane that incorporates an internally inserted 9X9, 1000 denier polyester weft reinforcing scrim. It can be used Fully Adhered, Mechanically Attached, and Ballasted Roofing Systems. Available in .045mil and .060 mil gauge. RPI Royal Edge Fire Rated EPDM Membrane is a non-reinforced, fire retardant, cured single-ply roofing membrane that can be used in Fully Adhered, Mechanically Attached, and Ballasted Systems. 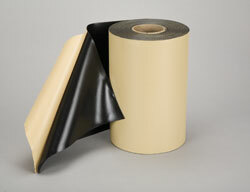 Used in Royal Edge EPDM and Re-Flex EPDM Systems. 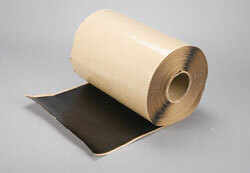 Used to adhere EPDM membrane to insulations, plywood, OSB, concrete, and block or brick. Check with manufacturer for compatibility of material with adhesive. 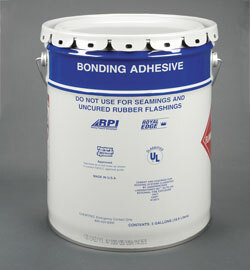 Solvent-based adhesive comes in 1 or 5 gallon pails. Average coverage is 60 sq. ft. per gallon. Coverage may increase/decrease depending on the porosity of the substrate. Adhesive is applied to both surfaces and allowed to "flash-off" (dry), before mating surfaces together. meets OTC (Ozone Transport Commission) VOC emission restriction requirements. Used in Royal Edge EPDM, Re-Flex TPO, and Re-Flex EPDM Systems. 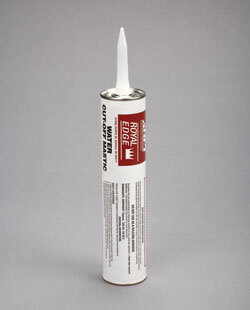 A low VOC solvent adhesive used to adhere EPDM/TPO membrane to insulations, plywood, OSB, concrete, and block or brick. Check with manufacturer for compatibility of material with adhesive. Solvent-based adhesive is available in 5 gallon pails. Average coverage is 60 sq. ft. per gallon. 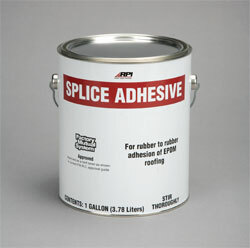 Enviromentally friendly water based adhesive. 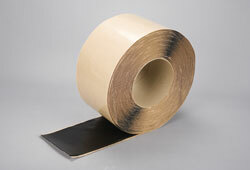 Used to adhere EPDM membrane to insulations, plywood, OSB, concrete and other low slope surfaces. May be installed "wet", (single surface), or "dry", (applied to both surfaces and allowed to "flash-off" (dry). Adhesive is white when wet, and turns clear when dry. Approximate coverage 100-120 sq. ft. per gallon depending on pouracity of substrate. Used when adhering one membrane to another, cured or uncured, (i.e. field seams, flashing details). Approximate coverage: 125 sq.ft. per gallon. 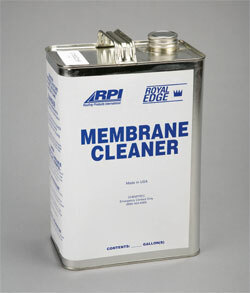 Membrane surfaces must be cleaned with Membrane Cleaner before applying Splice Adhesive. Used to clean EPDM surfaces before seaming with Splice Adhesive or Seam Tape. Also used to clean Metal Drip Edge prior to installing Cover Strip or Cover Tape. Used in Royal Edge EPDM, Re-Flex EPDM, and Re-Flex TPO Systems. Meets OTC (Ozone Transport Commission) VOC emission restriction requirements. Used in Royal Edge EPDM, Re-Flex EPDM, and Re-Flex TPO Systems A specially formulated cleaning agent used to clean talc and other contaminants from EPDM and metal flashings prior to applying Splice Adhesives or Primers. Royal Edge Low VOC Membrane Cleaner is formulated to meet low VOC restrictions which may be required is different states. 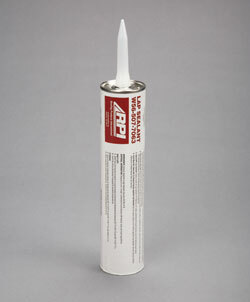 Solvent-based primer applied to clean membrane prior to installing Seam Tape or Tape Backed Cured or Uncured membrane. Apply with RPI Scrub Pad. Available in1gallon and 5 gallon pails. Coverage~200 sq .ft. per gallon. Solvent-based primer applied to clean membrane prior to installing Re-Flex Seam Tape or Tape Backed Cured or Uncured membrane. Apply with RPI Scrub Pad. Available in1gallon and 5 gallon pails. Coverage~200 sq .ft. per gallon. Used in Royal Edge EPDM, Re-Flex EPDM, and Re-Flex TPO Systems. 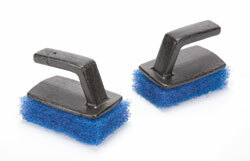 A porous scrub pad laminated to a plastic handle. Used to apply Seam Tape Primer/Activator. 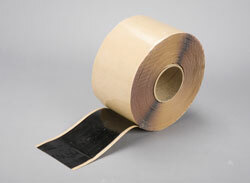 A butyl tape used to create a seam by adhering one membrane to another in lieu of using Splice Adhesive. Available in 3", 4", and 7" x 100' rolls. 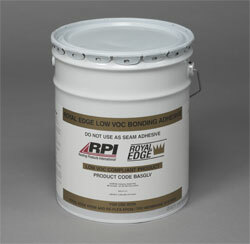 NOTE: Royal Edge Seam Tape Primer must be used before applying Seam Tape. Moldable uncured EPDM membrane used for flashing details, protrusions, T- Patches, and field seams incorporating angle changes. 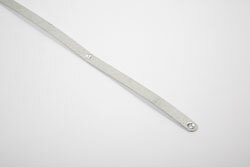 Available in 6" and 12" widths, and 50' and 100' lengths. 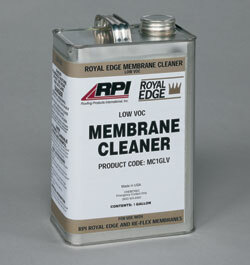 Use RPI Membrane Cleaner and Royal Edge Splice Adhesive. 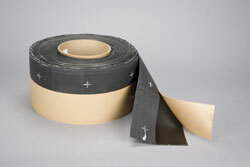 Moldable uncured EPDM membrane with tape backing used for flashing details, protrusions, T-Patches, and field seams incorporating angle changes. Available in 6" and 12" widths, and 50' and 100' lengths. 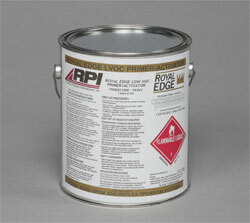 Use RPI Scrub Pad and Royal Edge Seam Tape Primer in application. Semi-cured EPDM membrane laminated to Seam Tape. 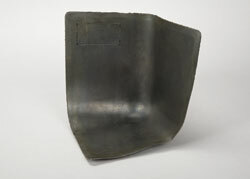 Used to flash in metal drip edge and other single plane (angle) flashings. Available in 5" x 100' rolls. 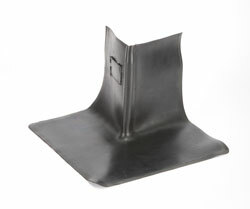 Strips of cured EPDM membrane used to cover cuts in the field membrane or exposed fasteners attaching metal drip edge. 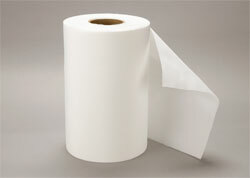 Available in 6" x 100' and 12" x 50' rolls. 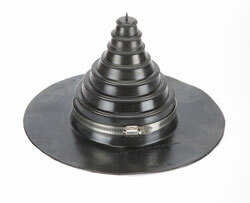 Multi-size (1"to 7" diameter) pre-molded EPDM boot used to flash pipes. Available with or without tape backing applied to the bottom flange. Pipe Boot should be terminated at top with stainless steel Pipe Boot Clamp. Cured EPDM pre-molded inside corners for new construction installation using Membrane Cleaner and Splice Adhesive. Pre-molded Inside Corners should only be used on new construction or tear-off installations where the angle changes are square. Cured EPDM pre-molded outside angle corners for new construction installation using Membrane Cleaner and Splice Adhesive. Pre-molded Outside Corners should only be used on new construction or tear-off installations where the angle changes are square. Used to caulk exposed edges of seams, edges of uncured EPDM flashings, top of Termination Bar and top of Pipe Boot clamps. Available in black and white. Approximate coverage ~ 25 ft. per 10.3 oz. Cartridge. NOTE: Does not have to be used on field seams/flashings utilizing seam tapes. 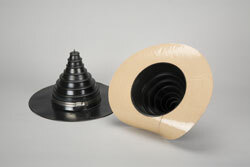 Multi-size (1"to 7" diameter) pre-molded EPDM boot with Tape used to flash pipes. Pipe Boot should be terminated at top with stainless steel Pipe Boot Clamp. Available with or without tape backing applied to the bottom flange. 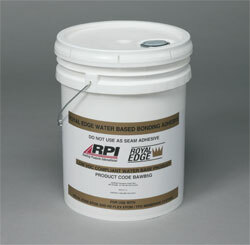 WATER CUT-OFF MASTIC Used in all RPI Royal Edge EPDM, Re-Flex TPO, and Re-Flex EPDM Systems. Water Cut-Off Mastic serves as a compression gasket preventing contaminates from accessing the roof system where the membrane has been mechanically terminated. Water Cut-Off Mastic is applied between substrate and membrane prior to installing Termination Bar. Also applied between a pipe and boot at top of Pipe Boot prior to installing the Pipe Boot Clamp, and between the membrane and drain prior to installing the drain clamping ring. Also used as a temporary overnight sealant or water-stop. Coverage per 10.3 oz. tube~20 ft.
Cured pads of EPDM used for protection of the field sheet where heavy traffic is anticipated. Available in 30" x 30" with tape. Pad thickness~3/8". 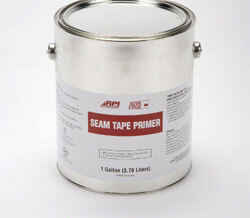 Use Seam Tape Primer. Used in all Royal Edge EPDM, Re-Flex EPDM, and Re-Flex TPO Systems. Ten-foot length of aluminum bar with holes 6" OC, used to mechanically secure membrane at walls, curbs, chimneys, etc. May be used in lieu of metal drip edge on certain fascias (metal, vinyl). NOTE: All holes in Termination Bar must be filled with appropriate fasteners. 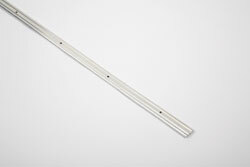 RPI Batten Bar is a high strength, galvanized steel bar with recessed installation holes spaced 12 inches OC. Batten Bar is used for anchoring Royal Edge EPDM to roof decks in RPI Royal Edge EPDM, Re-Flex EPDM, and Re-Flex TPO Systems. Appropriate approved fasteners must be used for specific deck types. ONE-WAY VENTS Used in all RPI Royal Edge EPDM, Re-Flex TPO, and Re-Flex EPDM Systems. 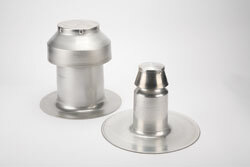 Installed to help release entrapped moisture in existing roof systems and aid in equalizing pressure within the system. RPI Non-Penetrating Batten Fabric is a high strength nylon fabric which is mechanically fastened to the roof deck utilizing RPI Batten Bar and approved deck fasteners. When properly installed as part of the RPI Non-Penetrating Batten System, the NP Batten Fabric provides excellent sheer strength and uplift resistance. 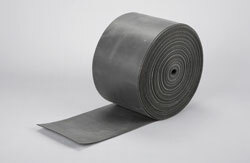 RPI Royal Edge Reinforced Perimeter with Tape is a 6 inch wide, black reinforced EPDM membrane designed for use as a non-penetrating field membrane base securement for Royal Edge and Re-Flex EPDM systems. RPI Stone Mat Separator Sheet is a nominal 3 oz. 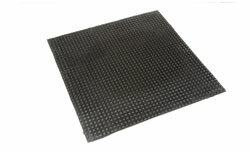 per square yard non-woven black fabric designed to be used as a separator sheet installed over RPI Royal Edge EPDM membrane prior to the installation of ballast, pavers or processed stone.